Country music is littered with tales of the sad, blowing whistle. Hank Williams told us in 1951 he heard that lonesome whistle blow. Some years later, country singer Merle Haggard said the first thing he remembers knowing is that lonesome whistle blowing. In country music at least, a blowing whistle seems to evoke sadness. The US has its own corporate version of this called the whistleblower. In short, a whistleblower is any employee of a company or other person who exposes information or activities that are deemed to be illegal or unethical. There are all sorts of whistleblower protections in the law premised on the idea that the whistleblower is a selfless individual acting out of principle, primarily interested in truth, justice, the American Way and so on. Of course, as with most things, these situations can also be more complex. In some cases, whistleblowers may not have been model employees and they are seeking to harm the company. 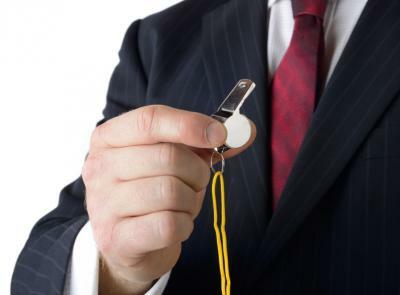 In others, employees will blow the whistle on something just when they realize they, themselves, are about to face disciplinary action. Still others are of the sort the laws were really intended for--those with altruistic motives trying to make the world better. For its part, the SEC even has an official Office of the Whistleblower. That makes sense when you consider the likes of Bernie Madoff, Enron, WorldCom, Tyco and others. The SEC is so serious about protecting against securities violations that it is authorized by Congress to provide awards to whistleblowers of between 10% and 30% of the money collected for actions where over $1mm in sanctions is ordered. At an even broader level, the Occupational Safety & Health Administration (OSHA) has a Whistleblower Protection Program that enforces the whistleblower provisions of more than 20 statutes protecting employees who report violations of various workplace safety and health, airline, commercial motor carrier, consumer product, environmental, financial reform, food safety, health insurance reform, motor vehicle safety, nuclear, pipeline, public transportation agency, railroad, maritime and securities laws. Employers cannot retaliate when employees report injuries, safety concerns or other protected activity. Consider that just a few days ago at the end of January a jury awarded more than $31mm in damages to a former Wal-Mart pharmacist. She had claimed she was wrongly fired after reporting safety concerns about co-workers dispensing prescriptions. While most of the money awarded was based on gender discrimination claims, the jury also found Wal-Mart's conduct was retaliation for her complaints about safety issues and/or privacy violations. Or take, for example, another late 2015 case where a judge ruled in favor of the FDIC. The judge blocked a former appraisal reviewer who blew the whistle on alleged fraud at a failed suburban bank from collecting any settlement the directors of the bank may reach with the FDIC. That judge upheld the ruling of another judge who found the FDIC cannot be considered a government agency for the purposes of the false claims law. Finally, consider a 2010 study by Shippensburg University of Pennsylvania. It studied a random sample of 15Ys worth of whistleblower lawsuits brought in state courts and found 74% of the whistleblowers were fired but only 22% won their lawsuits against their employer. This is clearly a touchy subject for all parties, so our advice is to tread carefully and to hire prudent experts to assist all along the way. No matter the outcome, blowing the whistle can be lonely. Yields dropped 6bp after Fed Chair Yellen signaled to Congress that market volatility could delay future rate hikes. Research by Javelin Strategy finds: opening new credit cards and other accounts in a victim's name have climbed 113% in 2015 and now represents 20% of all fraud losses. A PwC survey of banking and capital markets CEOs finds the following trends were ranked as the top 5 most disruptive over the next 5Ys: changes in industry regulation (87%); increase in number of significant direct and indirect competitors (66%); changes in core technologies of production or service provision (60%); changes in customer behaviors (57%); and changes in distribution channels (54%). The Financial Times reports negatively yielding debt globally now exceeds $5T, as central banks struggle to drive more economic growth abroad. A study by Allianz Life Insurance finds 44% of investors surveyed said their top focus in 2016 would be their overall health and wellness vs. 29% who said financial stability. Goldman Sachs reports the percentage of time millennials say they would spend to get financial advice is: willing to spend the time needed to get the best advice (28%); willing to do a one-time session for 1 hour or less (24%); willing to do a one-time session for 15 minutes or less (19%); willing to do multiple sessions over several weeks (16%); and would not seek out financial advice for a financial investment (14%). A Bank of America Merrill Lynch CFO survey finds the top business considerations threatening earnings are: health care costs (39%); weak domestic demand (37%); increased competition (31%); shortage of skilled talent (31%); and regulatory issues (28%). Research by Lockheed Martin finds: the FBI reports new cases of trade secret theft have increased 39% since 2010 and economic espionage cases have more than doubled in the past 18 months. Javelin Strategy research finds 4.84% of consumers were hit with fraudulent charges on a credit card or other account in 2015.